Looking to SQUEEZE every ounce of summer in before school starts? 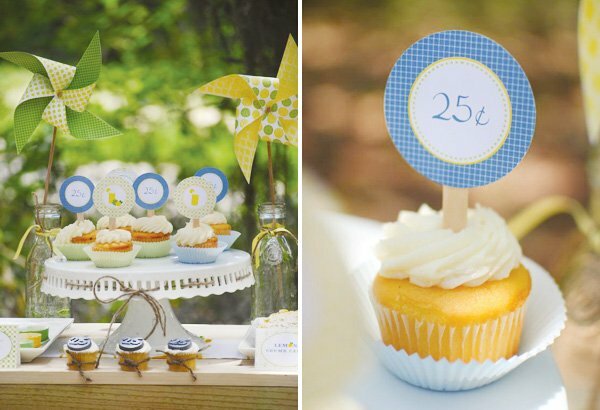 Andressa of Twinkle Twinkle Little Party whipped up a sweet Summer Lemonade Stand Theme that’s filled with fresh-squeezed styling inspiration and clever treats like pinwheel cookie pops and fondant coin-topped cupcakes. And those are definitely a steal at only “25¢” a pop! 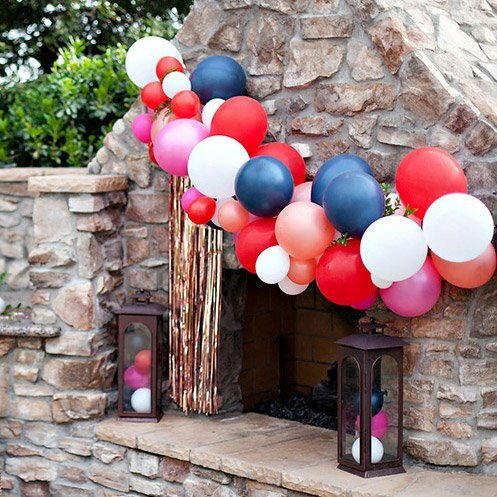 ;) This is a wonderful theme for a kids birthday party or any end-of-summer soirée! 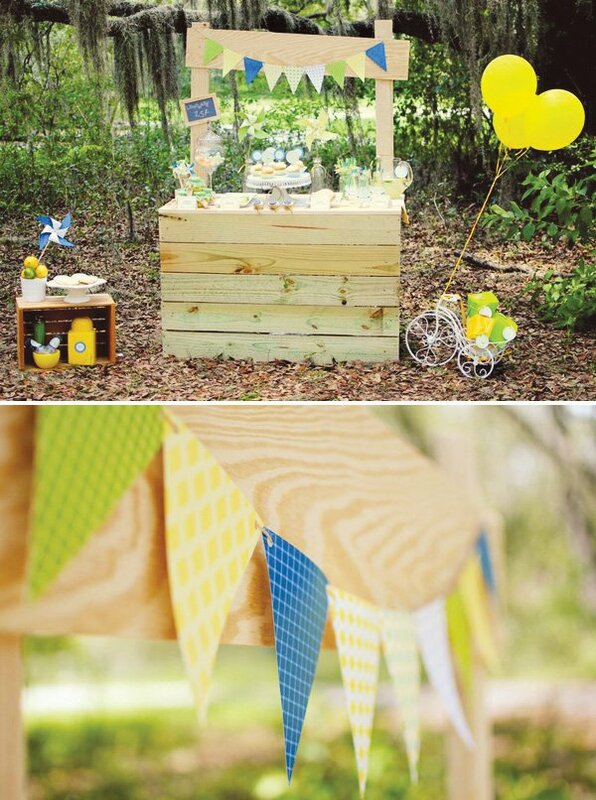 An adorable, homemade wooden lemonade stand! Twine bows & paper pinwheels and buntings to dress it all up! My husband built the lemonade stand following a tutorial. We purchased all the materials and supllies at our local Home Depot. 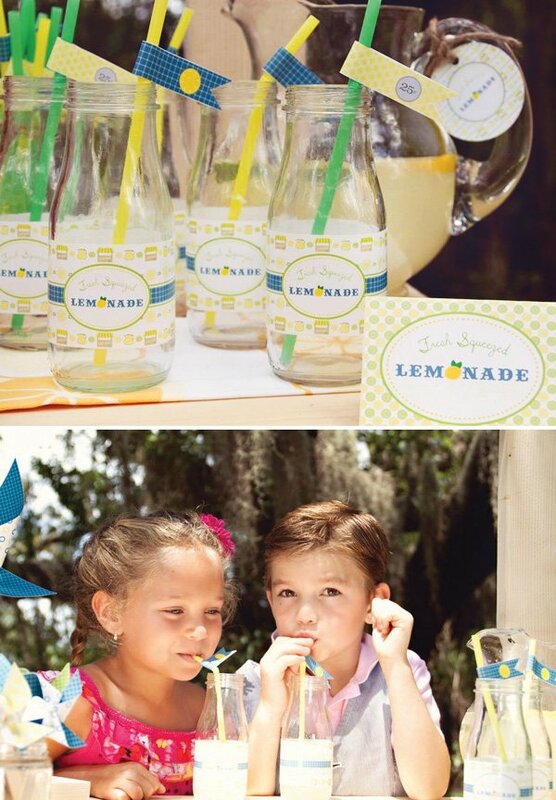 I did not want to design a printable collection using only the traditional colors of a lemonade party – yellow and green. I also wanted to incorporate some blue. I really liked how the blue brought some life to our shoot. 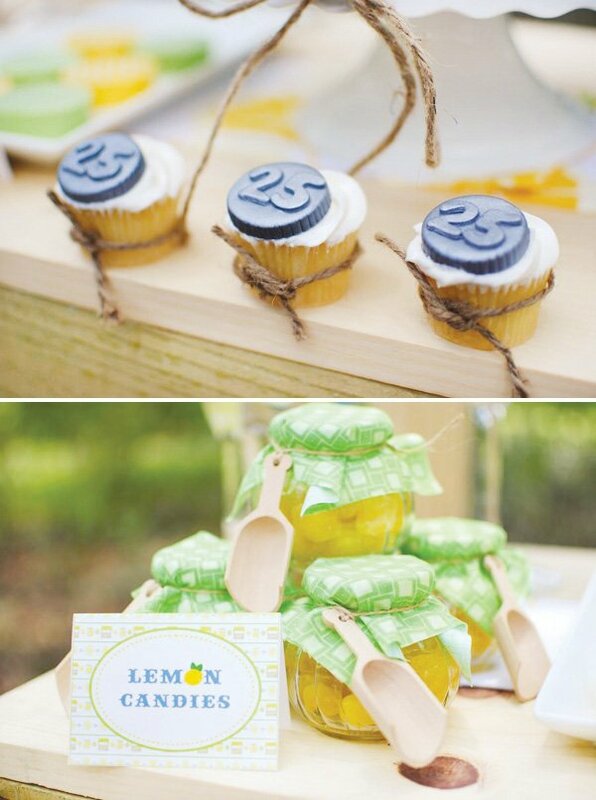 Mini jars filled with lemon candies – I decorated each jar with fabric, twine and cute wooden scoops. 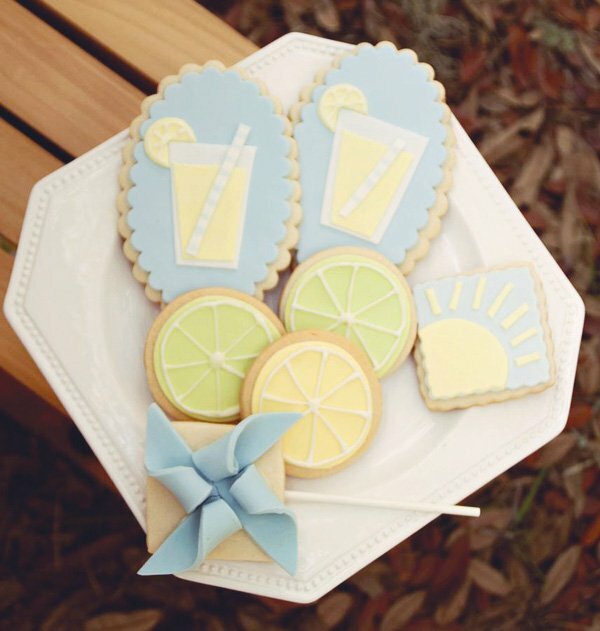 Amazing decorated cookies – lemonade cups with striped straws, lemon and lime slices & pinwheel cookie pops. Push pops I decorated with our printable stickers. 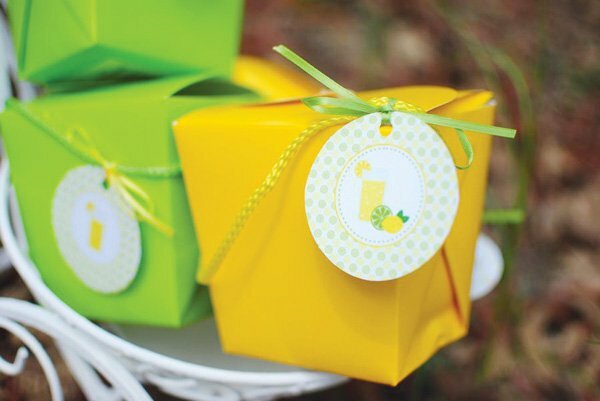 Yellow and green boxes personalized with our printable tags filled with lemonade mix the kids took home as party favors. 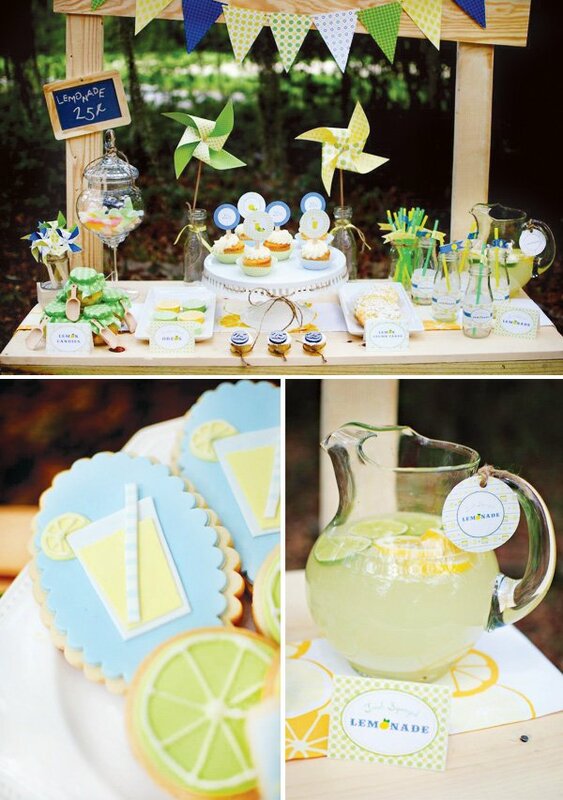 I placed the party favors on a cute metal bike which was right next to the lemonade stand. 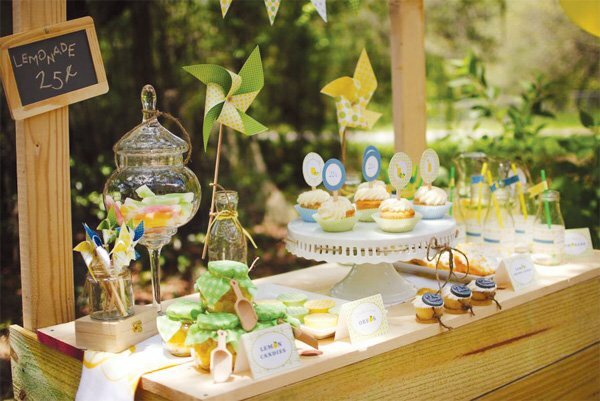 Colorful pinwheels and bunting, balloons, wooden crates, mini metal bicycle completed our Summer party decor. Push pops: Let’s get this party started! Such a creative party! A very beautiful work!